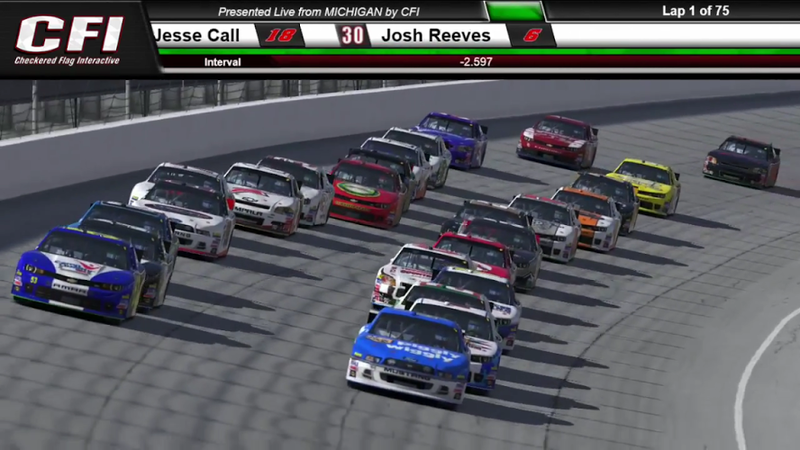 NASTRACK -vs- More Challenge coming to the green flag for Round #4 at Michigan. After a week away from the simulators the stars and cars of the NASTRACK & More Sim Racing leagues packed up their haulers, don’t worry all cars and motors were accounted for, and headed towards the Midwest track that is Michigan International Speedway. On deck The Kirsten’s Dream 150, a 75-lap feature placing some of the best sim racers on the very rough, very quick, 2-mile D-shape oval. A very special event as we hit the track not only to crown a winner but in my mind to pay tribute and raise awareness for childhood cancer. Fellow sim racer Randy Hughes lost his daughter to the courageous battle with cancer. We hit the track in her honor and I suggest everyone hit the Facebook page created in her honor Kirsten’s Dream Foundation. Right out of the gate familiar names from both leagues found their names nestled at the top of the leaderboard. Keith Maiato would top the charts as the only car to post a time in the mid two’s (40.257), the rest of the field found themselves running three’s & four’s. You know you are going to have a barn burner when the top sixteen of twenty-eight cars that took time were only separated by two tenths of a second. Though Maiato was fastest in practice he was not able to duplicate those results in qualifying, posting a time only tenth fastest on the field. Don’t worry though I will just go ahead right now and let you know not to count him out just yet! Travis Wall, sporting a new color scheme again this week, posted the fast time of the session with a 40.337 (178.5 mph) to grab the pole. Todd Marcotte, Shawn Pierce, Steven Burnett, and Chris Simard would round out the top five all posting times within a tenth of a second of the top spot! Just after 8:30 PM EST the green flag was displayed to the field and it was on! The top three drivers hooked up practically nose to tail and separated themselves from the rest of the pack. The rest of the field decided to follow suit and fall into line and started logging some laps and really get a feel for the car as well as working the different lines within a full pack of cars. Small battles for positions took place throughout the entire field from about the middle of the pack on back. We did not find the first caution till lap 14 when the 92 car of Guy Driggers and the 38 of Laurie Melson made some contact sending Driggers around coming out of four. Looking back at replays it looks like the servers net coded the two cars together. Meaning no contact was seen however the code in the background say they did. Interesting enough this was the first and only caution of the evening! Fourteen laps into the seventy-five lap event was enough torture on the tires as pretty much the entire field decided to head down pit road to the attention of their crews. What made this interesting were the different pit strategies that go into winning a race. Some teams electing to take just two tires and gain track position while some teams rolled the dice and stayed in their box a little longer for those new left side tires. TheWeeklyRacer.com/Alpine Star Chevy Impala running P12 early in the run. I will say from personal experience the Alpine Star/TheWeeklyRacer.com Chevy came down pit road running just outside the top ten decided to take just two tires and a full tank of a Sunoco racing fuel. We figured on such a large track with sweeping turns we could at least get two stints out of the left side tires and the extra track position would help keep us in clean air as well as help pad out position when the tires started to fall off again. The strategy worked great until about the second lap into the restart when we had a computer malfunction that made the car very unstable in traffic. To avoid causing “the big one” we thought it would be best to slowly drop to the pack, regain our composer and mount another charge. The idea was there, however after some damage sustained, the car wasn’t. With the field doubled up and pit stops taking care of the green flag waved, and the engines came roaring back to life as the field drove full steam ahead into turn one! It almost looked like we were immediately going back under yellow flag conditions when the 08 of Glenn Stanley and Charlie Needham get into a little net code action immediately breaking the 08 loose and shooting him into the outside wall. He was able to keep the car up high and out of the way and we stayed under green flag conditions but not without causing some troubles for Maiato in the process, both drivers would fall to the rear and regroup. Back up front it was the ‘Wall & Burnett’ show with the top five hot in their tracks. The real racing was deeper in the field as they drivers were fighting tooth and nail. Two and three wide battles as far back as 18th & 19th spot, just going to show how much this series truly means to these drivers! With only one caution on the evening this was setting up something these drivers haven’t really done all that much this series – green flag stops. Wall and Burnett would both hand over their track position to make that long slow trip down pit road. It would not matter however because Wall would grab the lead back after the first round of green flag stops cycled through. Burnett and Wall, both representing NASTRACK, with a tremendous back and fourth battle for the top spot! Two amazing drivers battling not only for the win but for crucial points towards the NASTRACK organization who has been struggling a bit in this series. The leaders as well as a good chunk of the field hit pit road with just 16 laps to go for what was the final stops of the afternoon/evening which ever you may call it. Now let me set this up for you; 14 laps to go, Wall back to the lead after green flag stops, Burnett just tenths back followed by Keith Maiato, a full 1.31 seconds back! 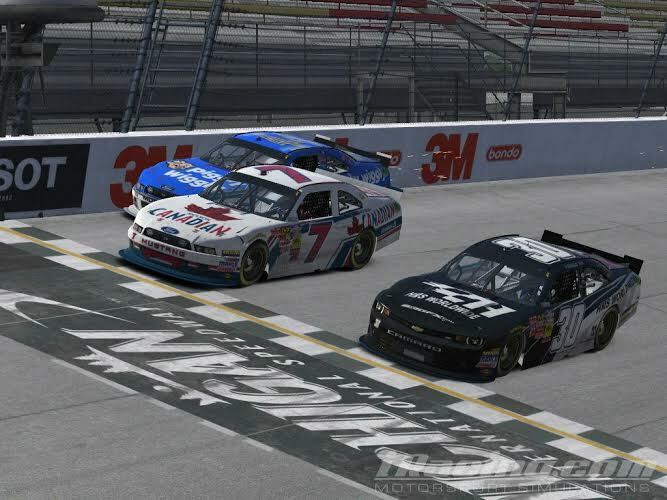 With just ten laps to go Burnett and Wall could not decide who would lead this race, both driver wanted the win no matter what team they were affiliated with! Just what Maiato wanted to see through his visor because he had to have opened up the nitrous bottle, he was closing in fast! The wild card would be how easy the lap traffic would play in the closing laps of this one. Just as you think things couldn’t get any better the top three drivers decided to turn the heat up even higher! Travis Wall and Steven Burnett went door to door while the 7 of Maiato were left to deal with the #2 NASTRACK team driver. Let me go on record by saying nothing huge or stupid was done to block the #7 as I am not the type of driver to do that but I had to make the pass just a little more difficult than normal to help the team out. My efforts however were not enough as Maiato was able to make it by me and catch the leaders who were still side-by-side for the lead. The white flag is displayed to the triplet of cars, Burnett with just the slightest advantage over Wall with Maiato hot in their trails. 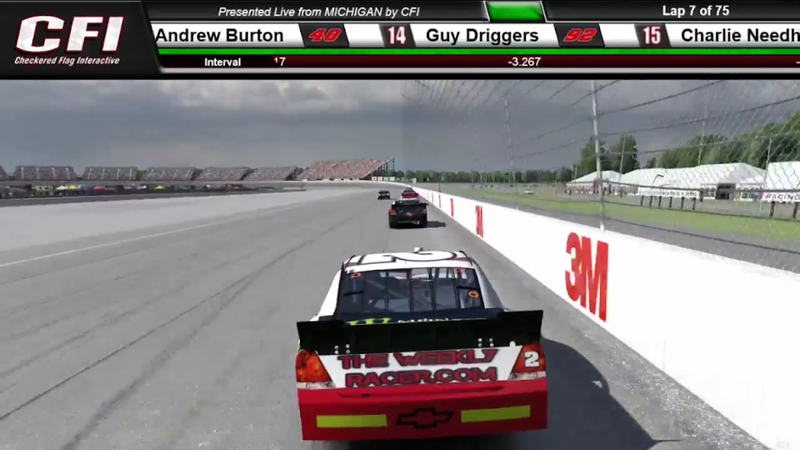 Maiato using the draft off two, pulls right to the bumper of Wall shoving him down the backstretch. Diving down into Wall & Burnett having to take the conservative route running door to door, this allows Maiato to get a hell of a run off of four. With nowhere to go Maiato sticks his nose between the two NASTRACK drivers and the fight was on. That 7 car immediately transformed from a racecar to a pinball. Bouncing off both Wall and Burnett it looked like he was actually propelled across the line first by .001 of a second! Maiato sneaks in by .001 seconds to steal the victory. As the laps were winding down and you guys were working through that lap traffic what was going through your mind? A chance to race that was and what an incredible show you put on for everyone watching. Anyone you would like to thank before we let you go to celebrate?